Iranian-American Alum Gives $17M to USC Viterbi Dept. "This is a gift to both USC and Los Angeles," said Astani, who earned his master's at the university in 1978. Sonny Astani, whose soaring high-rises and philanthropy are remaking downtown Los Angeles, has given $17 million to name the USC department of civil and environmental engineering. This is the fourth department naming gift for the school since it began its $300-million fund-raising initiative in 2001. USC President Steven B. Sample hailed the gift by Astani, who earned a master's degree in industrial and systems engineering from USC in 1978, two years after arriving in the United States from his native Iran. "Sonny Astani is a remarkable Trojan who is transforming Los Angeles," Sample said. "He understands the crucial role civil and environmental engineers must play as more and more people live in cities. We are deeply grateful at USC not only for his exceptional gift but for his majestic vision of urban life." Yannis C. Yortsos, dean of the USC Viterbi School, expressed his gratitude for the gift and said the department would be known as the Sonny Astani Department of Civil and Environmental Engineering. "Thirty years ago, by mere good fortune, I ended up in the best university, in the best city, in the best country in the world," Astani said. "This is a gift to both USC and Los Angeles. It is my hope that it will allow a new generation of civil and environmental engineers to rise to the increasingly complex challenges created by the urbanization of Los Angeles and the changes to the global environment we are now facing." Yortsos noted that civil engineering, the oldest engineering discipline, remains the branch of engineering that is closest to the lives of people, particularly in cities. "Civil engineers provide homes, water, sanitation, bridges, tunnels, roads and civil infrastructure and environmental engineering expertise is critical to solving problems of pollution and micro-climate," he said. "By 2030 almost five billion people, or 60 percent of the entire world, will live in cities. This raises huge challenges for civil and environmental engineers, challenges now known in the profession as those of 'megacities,' he explained. "Internationally we see an emerging vision for civil and environmental engineering as a major force for improvement and enhancement of cities, not only for Los Angeles, but for major urban centers around the world." And, Yortsos continued, "Astani shares our belief that civil engineering is vital to achieve a critical need for the 21st century: cities designed to be highly functional, healthful and inspiring; environments that celebrate humanity." Astani is the chairman of Astani Enterprises, a Beverly Hills-based development concern. His firm owns or operates approximately 4,000 apartment units throughout Southern California and is currently developing approximately 2,000 units of condominiums and lofts in downtown Los Angeles with a total value in excess of $1 billion. Among the developments are five iconic residential towers and two loft buildings. Last year, Astani Enterprises made a $1.5 million donation to the Skid Row Housing Trust, completing funding for the Abbey Apartments, a downtown complex that will house 115 of Los Angeles' mentally ill homeless when it opens next year. 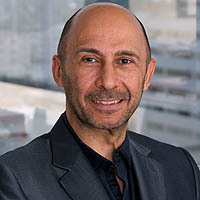 Astani, an Iranian immigrant who received a Distinguished Alumnus Award from the USC Viterbi School, serves on the executive committee of the Central City Association, the board of councilors of the USC Viterbi School of Engineering and on the Leadership Council for USC's Lusk Center for Real Estate Development. He is also a board member of the Pacific Council for International Affairs. The Astani donation is the seventh multimillion-dollar donation from a USC engineering alumnus in the last six years, following earlier gifts by Andrew J. Viterbi (naming the school); Daniel J. Epstein, Ming Hsieh and John Mork (naming the departments of industrial and systems engineering, electrical engineering, and chemical engineering and materials science); Mark Stevens (creating the USC Stevens Institute) and Kenneth Klein (creating the USC Viterbi Center for Undergraduate Engineering Life).